1. Allow for ample observation and imitation rather than verbal instruction. 2. Also allow students to take their time before attempting a task so that the chances for success are higher even on the first effort. 3. Make the group more important than the individual as often as possible in terms of both the learning process and learning goals. 4. Emphasize cooperation versus competition whenever possible. 5. Make learning holistic rather than sequential and analytic. Spend more time in dialogue talking about the big picture associations before looking at details. 6. Use imagery as often as possible. 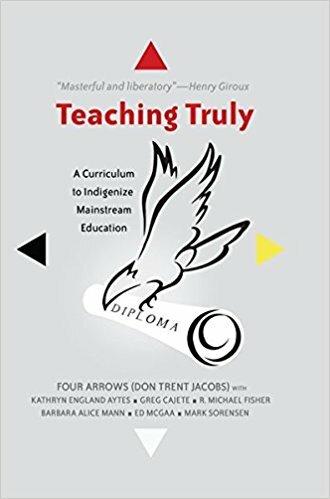 Einstein wrote that “imagination is more powerful than knowledge,” and Indigenous education takes advantage of this fact. 7. Make learning connect to meaningful contexts and real life. 8. Be willing to allow spontaneous learning opportunities to change pre-planned lessons. 9. De-emphasize letter grading and standardized evaluations and use authentic narrative assessments that emphasize whet is actually working best and what needs more work. 1. Make bringing everyone back into community the main objective. 2. Widen the circle of blame and involvement to include all possible individuals who may have some influence on the problem or the solution. 3. Use ample and appropriate humor throughout the process. 4. Appeal to a universal sense of love and power that connects all participants. 5. Discuss cognitive dissonance in ways that show it is human to react to it. 6. Avoid punishments and instead seek honorable reciprocity. 7. Refer when possible to the non-human kingdoms for metaphors.